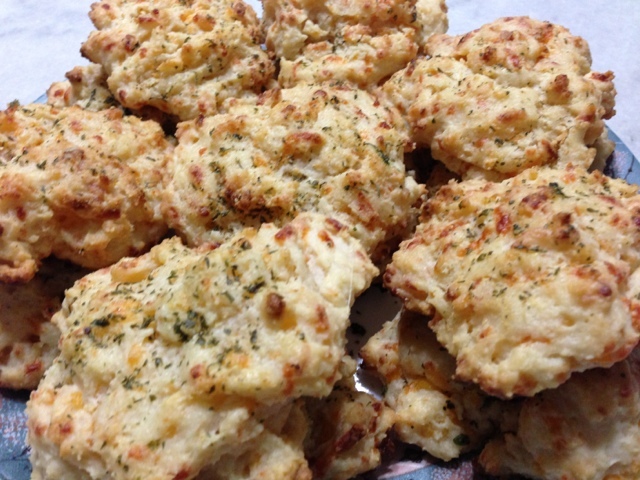 I don’t know anyone who doesn’t like these biscuits that are originally from Red Lobster. I devour them, and probably fill myself up with them before I am even served my dinner. And then take some home at the end of the night. I love them. Tonight, I made them from scratch at home! First, move your oven rack up to the upper or upper-middle position (I kept mine on the second of five racks). Preheat your oven to 400 degrees. Line two of your baking sheets with foil for easy cleanup (parchment paper or a Silpat would work too). In a [mixing] bowl, mix together the flour, baking powder, baking soda, salt, and garlic powder until it is combined well. Add in the cubed [softened] butter and use a fork (or your hands — hands made it much easier and quicker) to combine the butter into the flour mixture until it resembles coarse meal. You’ll end up with some pea size pieces of butter that are visible, and that’s all right. At this point, add in your mild shredded cheddar cheese and mix it well. Pour in the buttermilk and stir until everything is combined. Scoop your mixture with your hands (you could also use either two spoons or a 1/4 measuring cup, but I found it stuck to the scoop — hands worked best) to scoop the biscuit mixture onto the baking sheets. Pat them down to make them uniformed, but I’d leave the free-form shape. 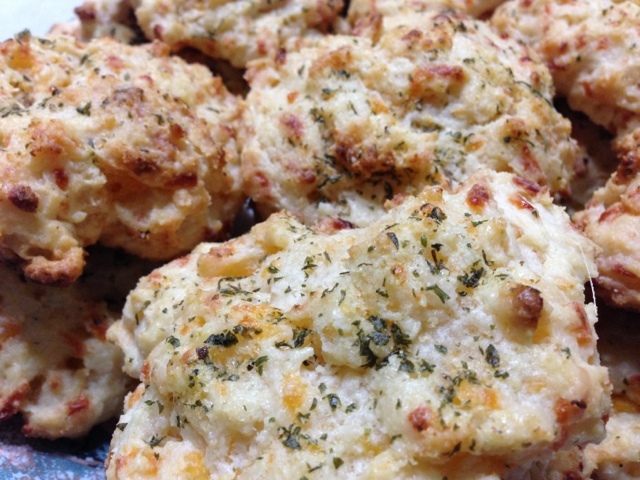 Let the biscuits bake for about 12 minutes, and them remove and brush with butter mixture (see step 6), and then bake for an additional 5-6 minutes until the top of the biscuits are golden brown. 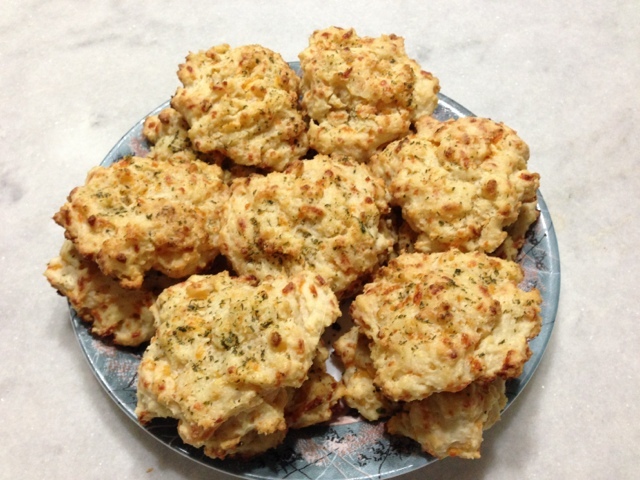 For the topping that you will brush on top of each of the biscuits: take half a stick of melted butter, and add 1/2 a teaspoon of garlic powder and 3/4 of a teaspoon of parsley flakes. Stir it nicely until it is well combined. 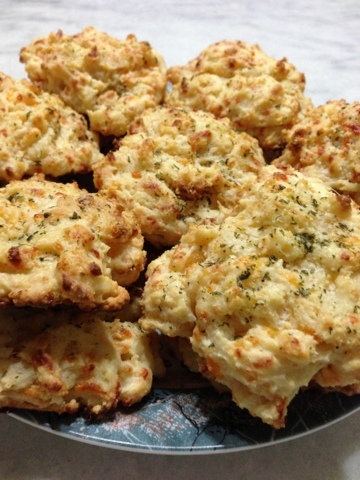 The biscuits can be served at room temperature, but are best served straight out of the oven! The above quantity made 16 perfect biscuits for me. The consistency, texture (inside and out), and taste were matching. I thought it’d taste similar, but I was pleasantly surprised how great they turned out. 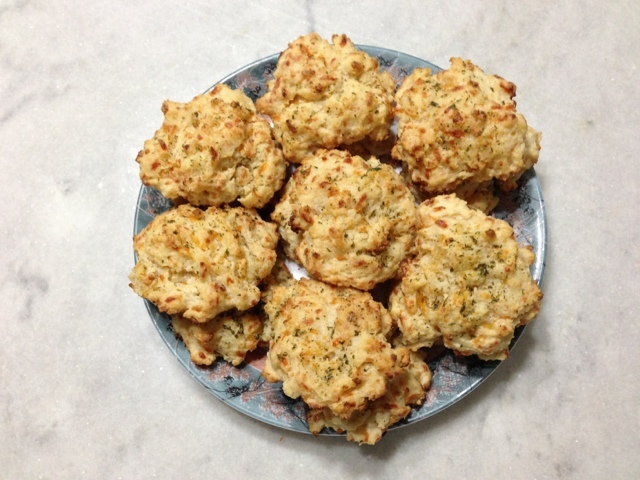 I found several recipes online for these biscuits, but they just didn’t seem right or had ingredients that I didn’t want to use (like shortening or oil). Others called for garlic salt (and I don’t like things that are too salty). Many used oregano and I didn’t think that was the correct herb to match the taste. I also didn’t want to use a biscuit mix like most of them called for. I like shortcuts like everyone else, but sometimes you want to do it right from scratch. Another challenge: most recipes, if not all, seemed to need cake flour. For some reason, neither of the two major grocery stores I frequent seemed to carry cake flour. Not sure what the deal with that is, considering when I Googled it, I was told that most, if not all, major grocery stories had them right by the other flours in the baking aisle. Yeah, apparently not where I live. So I improvised. **Here’s a tip for you if you find yourself in the same predicament as me. You can make a substitute for cake flour at home if you have cornstarch and all purpose flour (AP flour). Basically, 1 cup of cake flour equals 1 cup of AP flour minus 2 tablespoons plus 2 tablespoons of cornstarch. Confused much? I hope not. Basically take a cup of AP flour, but take two tablespoons out of it and put it back in your flour container. Then add two tablespoons of cornstarch to the remainder of the flour. A cup of this mixture can be substituted for every cup of cake flour you need for your recipes. 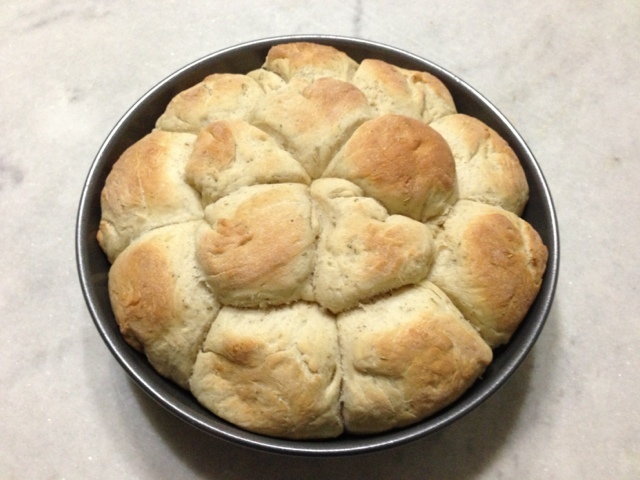 I had loaves of Italian bread sitting at home, and I couldn’t think of what to make with it. Flatten pieces of chicken cubes or breast fillets (I cut my fillets into tinier pieces today because I thought it would work best. Next time, I’d make them even smaller, bite size perhaps). Marinate your chicken with salt, pepper, paprika, garlic, ginger, cayenne pepper, oregano (about 1/2 teaspoon). In a large ziploc bag, combine breadcrumbs and about 1-2 tablespoons of parmesan cheese (this will depend on your preference… put as much more as you’d like). Then, in batches, add pieces of chicken into the ziploc bag. Ziploc the bag, and shake well to coat all the pieces of the chicken. Remove the chicken from the bag, and repeat until and the chicken pieces are coated. I do this portion in a ziploc bag for three reasons: a) easy clean up b) I don’t spend forever coating each piece of chicken — a huge time saver c) I always find that the coating is always done better this way and creates a nice crust. In the heated skillet, cook the chicken. 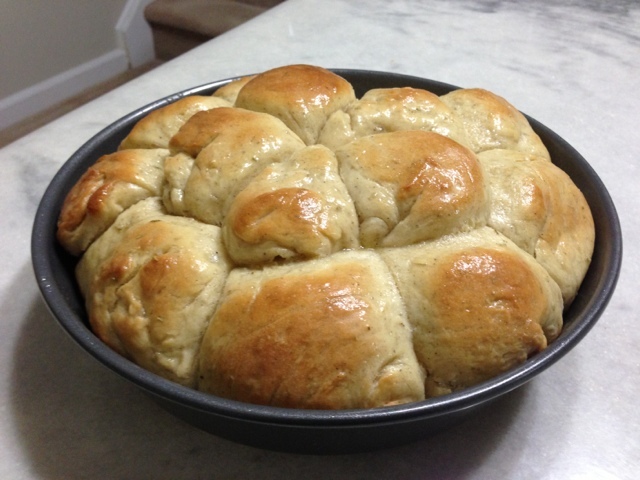 You could certainly make your own bread, or use whatever type of loaf/loaves you have at home, but I used store-bought Italian bread for mine. 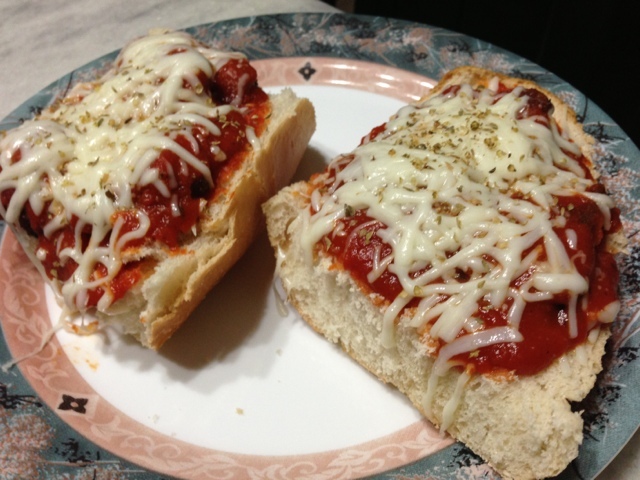 To assemble, on the loaves, spoon in a nice coating of (marinara) sauce. Add chicken on top, followed by more sauce (enough to cover everything). Sprinkle a generous amount of (mozzarella) cheese on top. Top with dried oregano leaves on top. 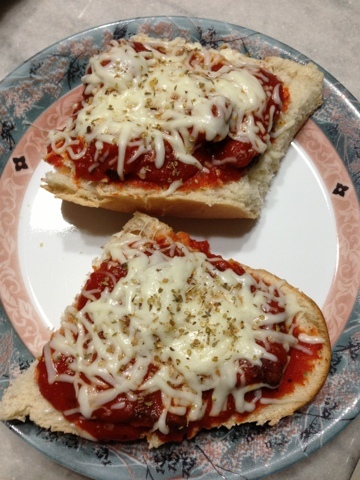 Put your open-faced sandwiches in the oven for about 8-10 minutes to warm up the sauce, and melt the cheese. Just watch the oven, the time will vary depending on the cheese and sauce. 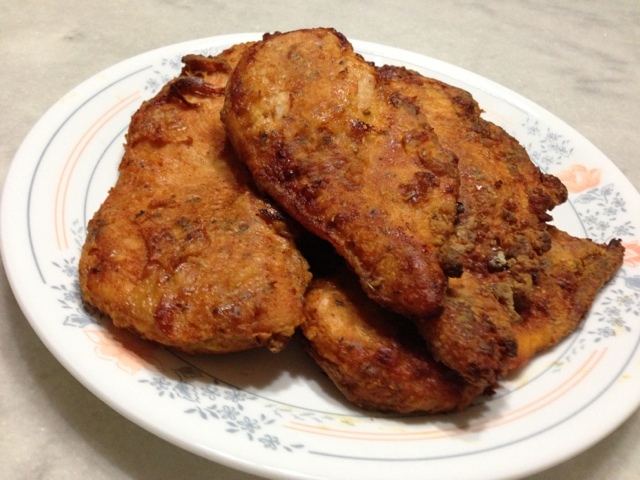 Cut the chicken into much smaller pieces so they are more manageable to cut and eat. Very quickly, I learned that I need a Stand Mixer. That a hand mixer simply won’t do. Not going to lie, but it was pretty hard to control the bowl and the hand mixer with the dough using the hand mixer. But the end result was great, so I guess it was worth it. Add the lukewarm water to your mixing bowl and sprinkle the yeast on top. Let it sit for about 10 minutes or so, until it becomes frothy. Mine didn’t become too frothy even by the 15-20 minute mark, but it still ended up fine. Just make sure your yeast hasn’t expired — most are instant these days so the end result will probably still be fine as long as your yeast is still good. Add your oil, egg, sugar, black pepper, and rosemary to the bowl. Then add the flour and mix on the low-to medium speed until the dough holds together, which takes just a few minutes. Then, increase speed to medium and knead the dough for an addition 3-5 minutes until the dough is formed. Cover the bowl with a damp towel and let the dough sit for about 20 minutes. Afterwards, add in salt and mix the dough on the low speed for one minute. At this point, transfer your dough to a large bowl that has been lightly greased (I used the non-stick spray, but you can also grease it with oil or butter). Cover your bowl with a damp towel once again and let it rise in a warm place [I let mine rise in the oven — KEEP THE OVEN OFF] until it has pretty much doubled, which takes about 1-1 1/2 hours. Grease the bottoms and sides of a 9-inch baking pan. Divide your dough in half and break off 7 pieces of dough, each about the the size of a golf ball, from each half. Roll each piece of dough into rounds and place in the pan about 1/2-1 inch apart (they should fill the pan after the final riser). Cover the pan with a damp towel and let them rise for another 20 minutes + the time it takes to preheat the oven. The rolls should expand to fill up the entire pan so if you can see more than a couple of spots of the bottom of the pan, let them rise for a little while longer. Brush the rolls with half of the melted butter and bake for 20 to 30 minutes, until they are golden brown [I pulled mine out around 25-27 minute mark]. Remove them from the oven and brush with the remaining butter. Serve immediately or at room temperature. After step nine, you can choose to freeze the dough at this point, if you are making it ahead of time. If you are indeed freezing, wrap the pan tightly in foil and place in the freezer. 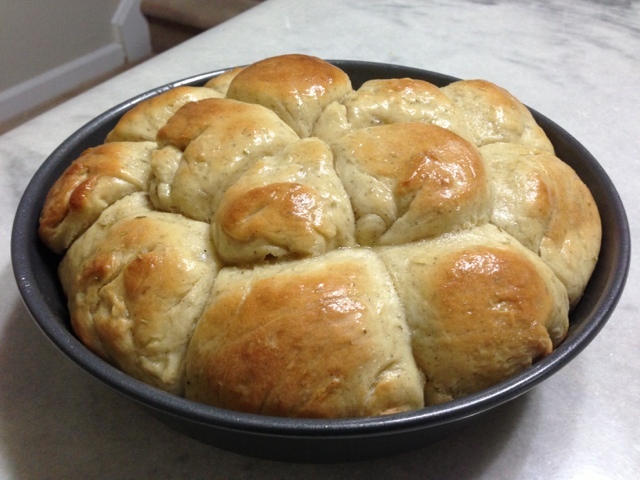 The day you want to bake the rolls, remove your pan from the freezer and let thaw on the counter – plan on about 2-2 1/2 hours for thawing and rising. I served this today alongside my Oven Fried Chicken [that also had rosemary in them]. This picture above is before I brushed on butter after it came out of the oven. I originally wanted to use thyme as the main herb in the recipe, but of course I had none at the moment. I had every other type of herb in my pantry, but of course not the one I wanted/needed. Parsley, Oregano, Basil, Rosemary, you name it… I had it. Anyways, I improvised. Since I was serving it with the Soft Dinner Rolls that also had rosemary, I decided to use that in the chicken along with basil. I preheated the oven to 425 degrees. Spray your dish with non-stick spray. Meanwhile, I took boneless skinless chicken breasts (would work well with boned-in as well other types of chicken pieces I suppose) and after cleaning them, I didn’t let them dry completely (this is important because it gave it the crispiness without using eggs or something else to help create the crust). I marinated it with salt, pepper, paprika, garlic powder, cayenne powder, basil, and rosemary. I seasoned flour with cayenne pepper, basil leaves, and crushed rosemary as well. Coat the chicken pieces in the flour mixture, and transfer them into your dish. At this point, I also sprayed the chicken from the top with the non-stick spray to help give it a crispy crust. Your cooking time may differ depending on the type of dish you use. I used a glass dish, and I cooked it originally for 25 minutes, then flipped the pieces around and let the other side cook for another 20-25 minutes after spraying the bottom of the dish once more with the non-stick spray. 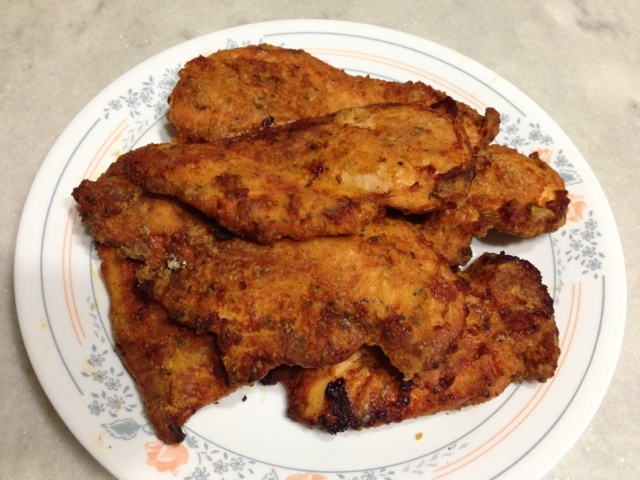 Update 1/03/13: when I made it again today, I made the oven fried chicken on a baking sheet lined with foil. The cooking time in this instance was about 20-22 minutes on the first side. After flipping the chicken pieces over, I baked it for another 15 minutes on the other side. They turned out moist, crispy and delicious… but I’d make sure to serve it pretty quickly after making it to avoid sogginess or them getting tough. P.S. This post is a part of my “What’s for Dinner” series, where I share what what I’ve been cooking and my recipes. Today, I made shrimp similar to the one I made a few weeks ago. This time, however, I baked it. In my opinion, it turned out better (in comparison to the sauteed version from last time). I think baking it helped the shrimp cook evenly too. As always, I kept it really simple- and used the spices I use in pretty much anything [and I mean everything]. I marinated the shrimp with salt, pepper, garlic powder, paprika, cayenne pepper, chili powder, and lemon juice. I baked it in a preheated 400 degree oven for about twelve minutes, turning over all of the shrimp at the halfway point for even cooking. Today, I served it with salad, biscuits, and hash browns. Roasted potatoes and rice would work wonderfully as well.